If you haven't tried them you need to. They're fantastic and unfortunately have become a staple around here. Crush an entire bag of Oreo's in a food processor then add a brick of cream cheese. Whirl that around until everything is mixed and use a small cookie scoop (or your hands) to make balls. Line them on wax paper or a cookie sheet, freeze them for an hour, then dip into melted bakers chocolate or almond bark. Keep them in an air-tight container in the freezer. Try not to eat all of them in one night. While I was making a batch I thought about making heart shaped ones for Valentine's Day. It worked! 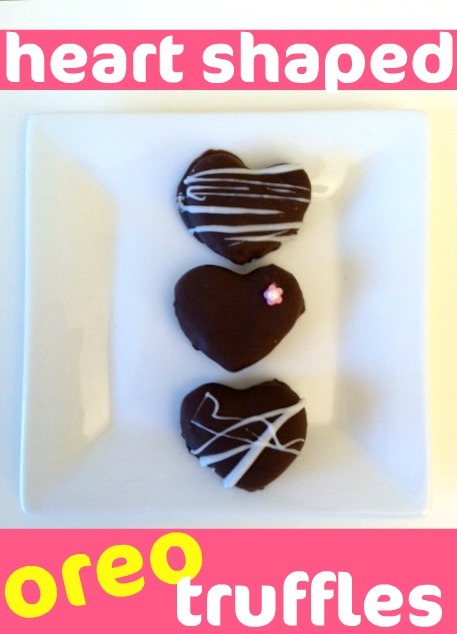 Instead of balling them, use a cookie cutter or a knife to make the hearts. Freeze and dip like normal. After dipping them in chocolate have fun decorating them. I melted white chocolate and the kids helped drizzle it on. We also used food coloring to make pink chocolate to drizzle but those were eaten before I could snap a picture! Your Valentine's will love them. Mine sure do! Have I been living under a rock? I've never heard of these but DANG, I needdddd some now! So glad to be the one to introduce you! Hope you enjoy them! You had me at Oreo! We're throwing a going away party for a friend tonight and I may just have to make a trip to the grocery store and make some of these. Speaking of Oreo's, have you ever tried that Slutty Brownie recipe that's been floating around on pinterest? Oreo, cookie dough and brownies - what could be better? I made some over the holidays and used mint oreo's and it was amazing! LOVE Oreo truffles! Come share these at my FIRST link party! Sarah, thanks for the invite! Jenny, um..no! I've never heard of the brownies. Thanks so much for telling me! I'll check them out for sure! Yes, make the trip and make these. Just do the balls it will be faster. Hope you like them! Sounds yummy and looks so cute too! These look delish and they're so adorable! I would LOVE for you to link this up to my new link party! so cute, I love using cookie cutters this way, so many possibilities! I've never heard of these either, but they sound divine! I'm going to make the heart shaped ones for my husband's Valentines treat. Pinning them right now!! Oh, man, I felt bad because I'd never had Oreo truffles before this Christmas, but I have fallen in love! This is a very cute idea! Great idea! I'm totally pinning this for my Valentine's Party! These truffles look great. Thanks for sharing at Bacon Time and good luck. These are incredible! Perfect for V-Day! Thanks for sharing at oopsey daisy! I just emailed you about featuring these in a V-day ebook. Drooling! Off to pin these! Thanks for linking up to Fun Stuff Fridays!